CinemaDrape Minimize distractions and focus on your task by blacking out other screen areas. If you find yourself in a situation where you need to concentrate on a specific job then this useful ergonomic tool will be the ticket to achieve that goal. "The best thing about CinemaDrape is you no longer have to manually clean up your work screen or close other opened windows. You just get rid of distracting visual elements." "Cinemadrape is an awesome application for Windows which can be used to completely fade out selected areas of the screen." "Overall there's no doubt that CinemaDrape works very well, and the program does provide plenty of configurability." "CinemaDrape is a great way to turn off the 'background noise' so you can focus on one particular app or area of your screen." "CinemaDrape may not be the killer productivity app that the Ford Model T was, but it's better in this respect: you really can have any color you want, not just black." "CinemaDrape provides a digital curtain for the screen. For users that want to hide potential distractions, CinemaDrape is the ideal tool." "CinemaDrape is one of those tools that you run for the first time and realize you have been always looking for such a thing." "CinemaDrape can take a load off your eyes, and allow you to read only what you want to read or see what you want to see. ... Regular ad blockers will not work like CinemaDrape will." "If you're feeling like you're not getting enough work done, try CinemaDrape." "CinemaDrape can make watching videos or working on other tasks more enjoyable and less stressful by blurring out distractions. ... In fact, it can be used for any task, really." "CinemaDrape covers your desktop with a black screen except for the current application, so you can eliminate background distractions and help yourself focus on getting something done." "Are you a Facebook addict, attention deficient, or simply can't pay attention to ANYTHING?!?! Well, ladies and gentlemen, today is your lucky day ... It's called CinemaDrape, and it's free." "Need to focus without all those other windows distracting you? 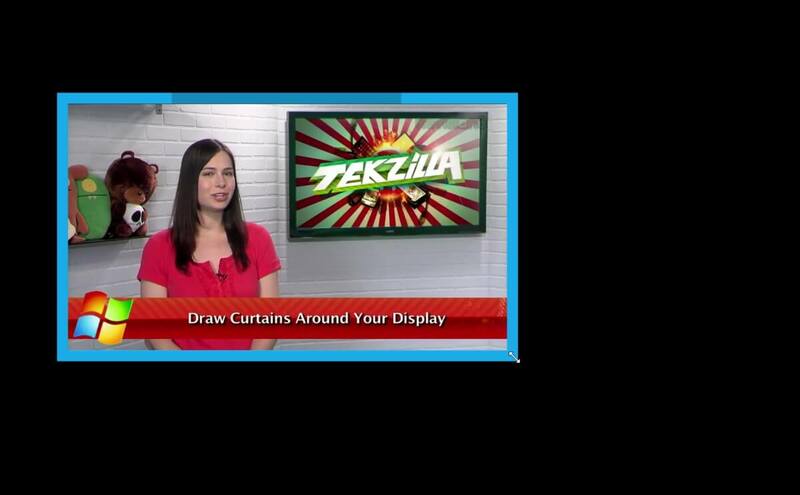 On today's Tekzilla Daily, Veronica shows you how to use CinemaDrape to close out everything except your most important task." "CinemaDrape enables you to darken your screen, except for a selected area, thereby eliminating visual distractions from desktop clutter or other screen elements." "A brilliant free desktop application that allows you not to get distracted by obstructing a specific area of the screen with custom colors and opacity." "It seems that on a PC, one cannot even watch a movie without getting distracted. Perhaps this is why the free software CinemaDrape has been created. ... CinemaDrape can be very useful." "Whether you're composing a document, watching a video or replying to an email, CinemaDrape forces you to give the job your full attention by hiding everything outside the main application." "As useful as your own creativity ... A recommended download." "It is amazing how efficiently this program solves the 'background noise' issue by clearing away all the distractions in just a few short clicks." "This is actually very nice, something I could get used to having. ... Yes, this is definitely a keeper." "Elegant simplicity ... It is a wonderfully simple yet effective gadget that can enhance your viewing experience. Well done to the developer!" "Really liking CinemaDrape on Windows to help focus on the task at hand"
"I was pointed to Cinemadrape and now can't live without it."